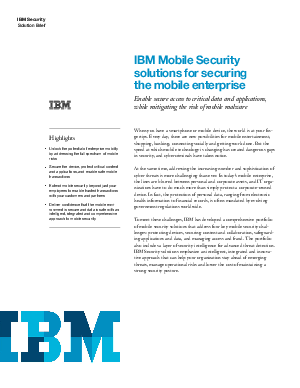 IBM has developed a comprehensive portfolio of mobile security solutions that address four key mobile security challenges: protecting devices, securing content and collaboration, safeguarding applications and data, and managing access and fraud. The portfolio also includes a layer of security intelligence for advanced threat detection. IBM Security solutions emphasize an intelligent, integrated and innovative approach that can help your organization stay ahead of emerging threats, manage operational risks and lower the cost of maintaining a strong security posture.